Black Forest’s School Garden has been supporting student learning about food production and the environment since 1982. Treasured by both the school and the wider community, the garden provides native plantings as an insight into the local landscape, fruit and vegetable production, chickens, a plant nursery and an outdoor kitchen and classroom. 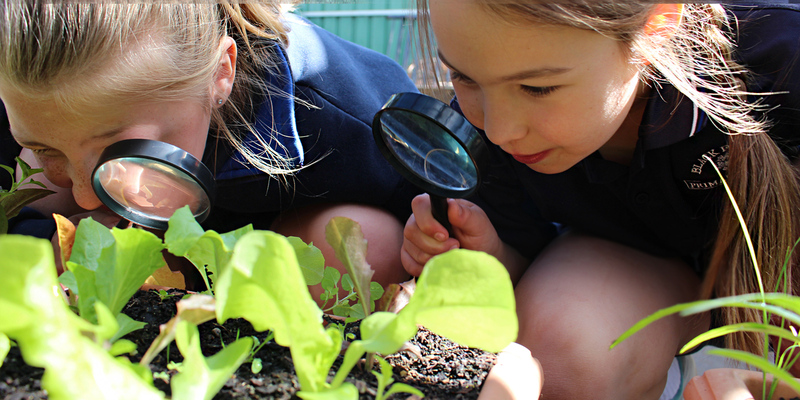 These elements provide a practical basis for students to develop their understanding of numerous curriculum areas, including health and nutrition, biological and earth sciences and STEM learning, as well as regular “Garden Club” opportunities for students to engage with garden art and maintenance activities. In essence, nature play provides opportunities for students to develop and practice dispositions for success “in the wild”. Using the resources available, children apply their knowledge in a practical context, echoing the behaviours of scientists, engineers, mathematicians, writers and storytellers. As such, Nature Play performs an important role in advancing site priorities by strengthening the fundamental skills required for engagement with STEM, high level achievement and intellectual stretch. Our nature play areas offer a range of nature play experiences for students, including cubby building, “loose parts” play, rocks and logs for development of balance and coordination and a fire pit for special celebrations. Further nature play areas are in the works for development, supported through the fundraising of our school community.